This 100-acre State Park and Recreation Area is a bit off the beaten path, located near the village of Honoka'a, about 15 miles east of Waimea and about 40 miles north of Hilo. The location of the Park keeps the traffic light. If you're looking for solitude, you have a great chance of finding it here. Located on the upcountry, windward slopes of Mauna Kea, the Park gets a significant amount of rainfall. This rainfall creates an enchanting and lush native forest. 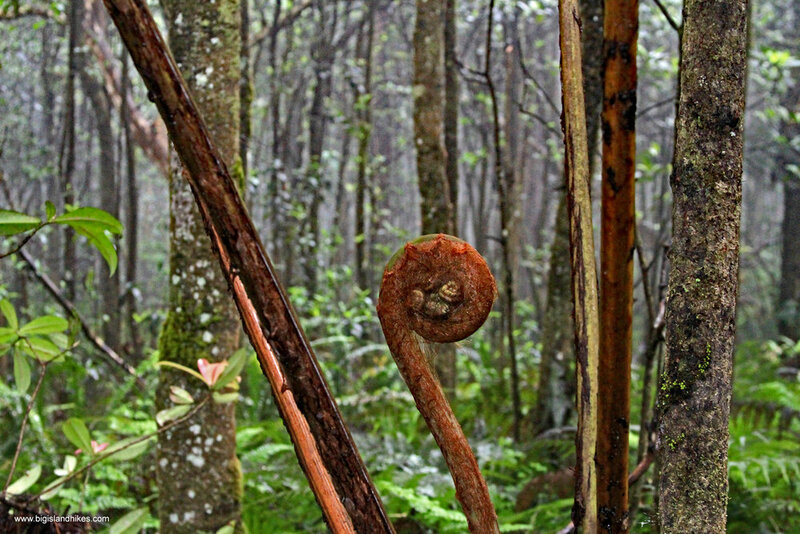 A 'native forest' attempts to preserve the endemic Hawaiian ecosystem as it existed before contact with man. Most of the plant species in the Park were on the island before the first Polynesians discovered and settled Hawai'i. The Park has a family-friendly loop called the "Nature Trail," with easy hiking and lots of information about the native forest. It's ideal for the keikis (kids) or for visitors short on time. There are also several other trails that criss-cross the Park and provide many opportunities to create different loops to explore the extent of the land. There's even a long trail intended for horses. There are restrooms but no water. Dogs are not allowed (except for service animals). Alcohol is not allowed, even closed containers. There are no fees for just day hiking here, but bring a couple of bucks for a donation or if you'd like to use a Park information pamphlet. Any passenger vehicle can make it to the paved parking area. There are extensive camping options, including cabins. Find out how to reserve camping from the Hawai'i DLNR. Trailhead: This Park is near the village of Honoka'a on the Hawai'i Belt Road, Hwy. 19. Travel either 15 miles east of Waimea or about 40 miles north of Hilo, and find the well-marked turn for Kalōpā State Park on the mauka (uphill) side of the road between the 39 and 40 mile markers. Keep following signs for the Park as you drive uphill on paved roads. (I'd give road names, but it's actually easier to just follow the Park signs). Eventually find the Park entrance and park in a the ample parking area near cabins. The best place to park is to skip the first few turn-offs and continue until the paved road ends at the arboretum. This is near an information kiosk and closest to the Nature Trail. Gear: At over 2,000 feet in elevation, this Park is much cooler than coastal destinations, so you should consider some warmer clothing. Rain gear is a must. The Park is often wet and muddy, so waterproof boots might be a nice idea. Don't forget your mosquito repellent. Hikes: If you're short on time or looking for an easy hike, take the Nature Trail right out of the parking area. You can use the other trails to customize a nice day here. I recommend walking the extent of the Gulch Rim Trail because it traces the edge of deep Kalōpā Gulch on one side and has lush forest on the other side. All of the trails are marked with blue or white paint splotches on trees. Refer to the topographical map for locations of these trails as you read the section below. Nature Trail: This is the most popular trail in the Park. It's an easy hike of about three-quarters of a mile with about twenty numbered stops to learn about the plants and animals in the Park. Pick up a trail guide at the trailhead and please leave a donation of $1. Find the trailhead near the parking area in the central area of the Park. 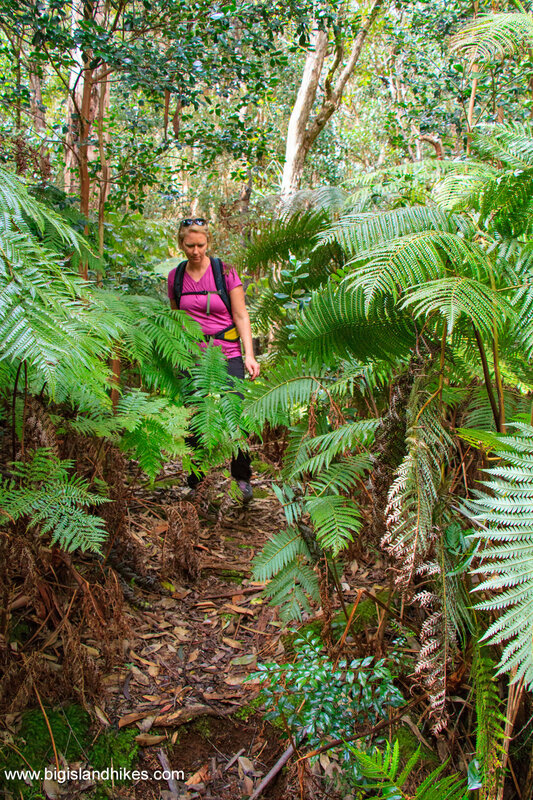 This hike is great for kids and also offers a great way to get a feel for a native rainforest with minimal investment of time and energy. This area of the park has a high canopy of ʻōhiʻa lehua trees that create dark and dramatic scenes as scattered sunlight fights to reach the forest floor. Although it's a short hike, you'll spend longer than you think here marveling at the deep and lush scenes along the trail. The trail can be a bit difficult to find at times, but trees along the route are marked with blue or white paint marks to aid navigation. 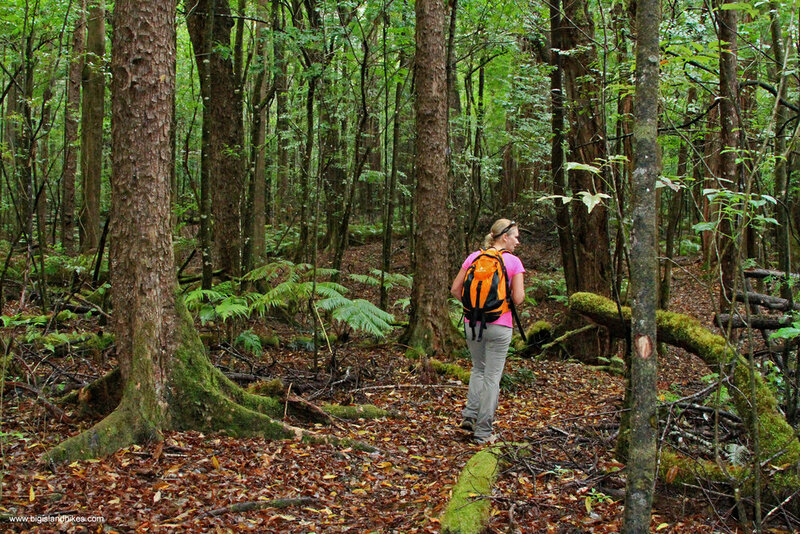 This is a high, cool rainforest, so plan on getting your feet and pants wet as you hike. Perimeter Horse Trail: This trail appears in blue on the topographical map above. This trail is designated for horses, but foot traffic is also acceptable (watch your step!). The trail begins shortly after entering the Park and before you reach the parking area. It progresses south, then west, before following the western perimeter of the Park. Horse traffic can either retrace their steps back to the trailhead or follow the "Old Jeep Road" trail back to the parking area. These are the only two trails in the Park where horses are permitted. The Perimeter Horse Trail is two miles long one-way, and gains over 450'. Robusta Lane: This 0.3 mile trail travels east-west and links the parking area to Gulch Rim Trail. Blue Gum Lane: This 0.5 mile trail also travels east-west and links the Old Jeep Road to the Gulch Rim Trail in the center of the Park. Silk Oak Lane: This 0.4 mile trail parallels the Blue Gum Lane to the south, linking the Old Jeep Road to the Gulch Rim Trail. Ironwood Lane: This is the most southerly in the Park and links the top of the Gulch Rim Trail to the top of the Old Jeep Road. It also intersects the end of the Perimeter Horse Trail. Old Jeep Road: It's hard to tell that this trail was once a road. It runs north-south for a little over a mile through the center of the Park and connects many of the other trails. Gulch Rim Trail: This trail follows deep Kalōpā Gulch on the eastern side of the Park. It connects the end of Rubusta Lane with Ironwood Lane, passing Blue Gum Lane and Silk Oak Lane. The trail is built on the edge of the Gulch. Kalōpā Gulch is up to two-hundred feet deep and originates near the summit of Mauna Kea, created by meltwater released from the Pleistocene glacial icecap of the giant shield volcano. Today, flash floods routinely pass through it. The trail stays right on its edge, so watch your footing. The trail requires you to cross a smaller feeder gulch to Kalōpā Gulch. Don't attempt it if water is raging in a flash flood, because it's possible to get swept off of a nearby cliff.